I was in Grant Park when I witnessed a worker treating a tourist client terribly. I was so frustrated with their actions that I called my mom to complain about this stranger’s hospitality and customer service skills. I still reflect on that moment and allow it to inform the way I work with my guests today. I have 9 years of hospitality experience in tourism; I also worked in restaurants for the 5 years before that. I am very honored that I am the hospitality professional of the month because of the many deserving people in the Chicago hospitality industry that shine and bring so much to the table! I hope that my friends would say that I do everything in my power to help everyone succeed with their programs and initiatives so that we can all be most hospitable and give our clients five-star service. We are all stronger together. What qualities do you feel a person needs to excel in as a hospitality professional? You need to be able to think outside of the box and treat every guest the way you would want someone else to treat the person who is most special to you. I was crouched down tying my shoe, and I met one of my nearby neighbors who happened to own a tour company. He offered me a job and the rest was history. My parents have been the major influence in my life. They have selflessly given everything they can to anyone in need. They are thoughtful, kind, generous, and have made it their mission to teach me everything they know. I would not be where I am today if they had not mentored me and given me wings to fly. Good old fashioned sarcasm and impressions. An ocean front beach, I love the sound of waves and the smell of salt. This week my favorite movie is My Cousin Vinny. The one liners are classic. 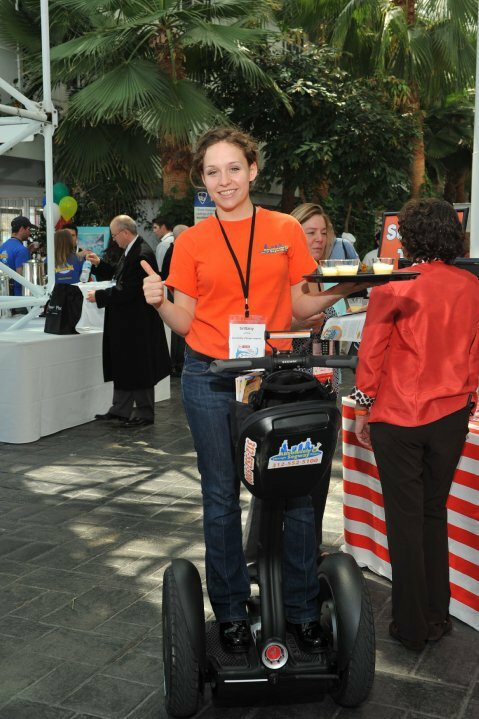 Growing Absolutely Chicago Segway Tours’ business while ensuring the same quality of service and safety that we exhibit today. I love a busy Saturday at Segway when our biggest concern is the number of Segways we have. There is something wonderful about walking out the door after a busy day and knowing that you could not have done anything more. My family was very loving with just enough sarcasm to keep things interesting. I was very inquisitive and am told now that I asked way too many questions! Most times I would rather go hungry than eat a salad. Absolutely Chicago Segway Tours received the Trip Advisor certificate of excellence for 4 years running, while maintaining a 1st, 2nd or 3rd place rating amongst Chicago tours. What type of events you plan? We don’t really focus on events but we frequently custom tailor tours to meet the needs of guests who want a very personalized experience that they will never forget. I used to be a very competitive horse rider. What an incredibly hard question! Chicago may be the best city to eat and drink in. Each positive culinary experience offers a little piece of magic that is unique and extraordinary. If I had to pick one restaurant, I would have to pick The Gage because my husband and I met at the bar. They also have wonderful food and drinks, but the nostalgia is seals the deal for me on that one. I love most things! Reading is spectacular, riding a bike is exhilarating, eating is always a great idea, painting can never lead you astray. In short, I love life and the many experiences that it offers. I am a painter and love to participate in shows and exhibits. I am representative for Absolutely Chicago Segway Tours, who is an affiliate of the National Hotel Concierge Association, Magnificent Mile Association, and the Chicago Loop Alliance. I am a huge Chicago fan. I try not to pick favorites, but if I had to choose a preferred baseball team I would choose the Sox. I am thrilled that Chicago’s Cubbies won the World Series. Greek yogurt, strawberries, and honey nut cheerios all in one bowl. It’s easy, delicious and filling – the perfect trifecta. Traveling and helping to solve the literacy deficit with at-risk youth. My first concert was not notable, but I went to see Kiss instead of going to my senior prom. I would like to be fluent with the entire Adobe Creative Suite. It is an excellent resource for any industry professional. Jim loves Chicago, and his love for the city shines through his website Here’s Chicago. The organization does a fabulous job of bringing suppliers, buyers, and other industry professionals together.